Home Crepe Blog Happy New Year! Healthy Eating Starts Here! Let’s face it – most New Year’s resolutions are about hitting the gym and getting a healthy start to the new year. At Crepe Delicious, we are committed to healthy and nutritious eating. All of our crepes start out with our signature batter – and each crepe is only 130 calories and 3.5 grams of fat. Fill it with fresh and nutritious veggies and lean protein and you have a healthy meal option. We prepare all of our crepes fresh-to-order so you tell us what you like! 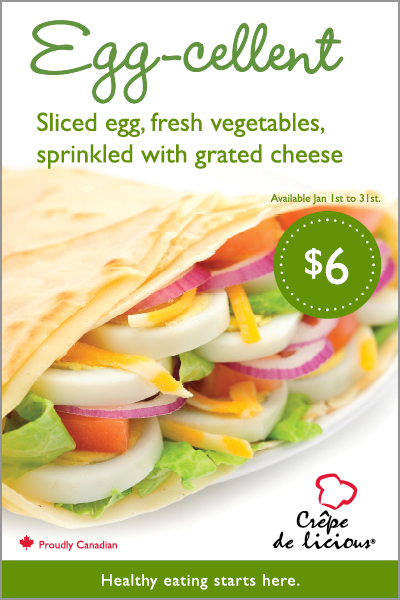 This month, try our Egg-cellent crepe – made with sliced egg, packed with fresh veggies and sprinkled with grated cheese…all for $6. Try this for a healthy start to 2012!